Dr. Cindy Stone received the Tony and Mary Hulman Health Achievement Award for Distinguished Service on Thursday, October 13. The award is co-sponsored by the Indiana Public Health Foundation, an independent, public not-for-profit health institute dedicated to promote and protect the health of the individual through education, research and resource management, to achieve a higher quality of life, a healthy environment, and to foster greater knowledge of public health and the Indiana Public Health Association. Dr. Stone is an associate professor of health policy and management and directs the department’s MPH concentration at the Indiana University Richard M. Fairbanks School of Public Health in Indianapolis. 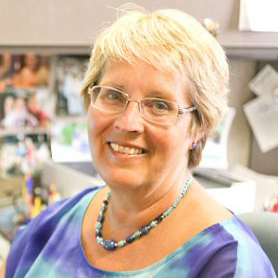 She has been a faculty member at IU for almost 24 years and during that time has worked on a variety of health issues. Dr. Stone coordinated a cancer education program with Marion County Public Health Department and Indianapolis high schools to educate over 10,000 high school health students on cancer and cancer self-examination. Since 2009, she has been involved in a community health needs assessment at the request of the Rush County Health Department. Dr. Stone worked to update the assessment in 2015 and the Rush County Health Department was the first Indiana county to receive accreditation, which was announced in May 2016. Dr. Stone worked with the Marion County Health Department to train and educate public health professionals on how to use health impact assessments (HIA). In 2015, she examined the impact a grocery store would have on the Avondale Meadows community, a food desert in Indiana. The assessment was used to attract a full-service grocery store, and it was announced in August 2015 that Save A Lot will build a new store in the community. This project was presented at the 13th International HIA meeting in Geneva, Switzerland in 2013 and at the APHA annual meeting in 2013 and 2014. It was also selected by the Society of Practitioners on Health Impact Assessment (SOPHIA) as a model report and was posted on the SOPHIA website in 2015. To encourage more use of health impact assessments Dr. Stone is serving as the Editor in Chief of the newly created Chronicles of Health Impact Assessment (CHIA). In 2012 Dr. Stone was appointed to the Indiana Attorney General’s Prescription Drug Abuse Prevention Committee to represent the Indiana State Nurses Association. She assisted in writing a survey that was sent to physicians, nurse practitioners and other narcotic prescribers across Indiana to address their knowledge of overdoses and use of INSPECT. She has worked to strengthen INSPECT for prescription monitoring, treatment options, criminal justice drug take back programs, and the effects of neonatal abstinence syndrome. In addition to her achievements, Dr. Stone has been a volunteer with the American Lung Association TB Education Committee since 1997. She has served on the APHA Governing Council and the Quad Council of Public Health Nursing Organizations for 2014 to 2016. She was appointed by Indiana Governor Daniels to serve on the Indiana State Home Health Services and Hospice Services Council. Dr. Stone was also elected to the Indiana State Nurses Association Board of Directors. She is a peer reviewer for the McMaster University Online Rating of Evidence. And she is working on the Indy Food Council, Food Access task force that started in 2015. This article was also featured in the Friday Letter, the Association of Schools and Programs of Public Health’s (ASPPH) complimentary e-newsletter. The Friday Letter disseminates stories that speak to and further ASPPH’s mission to promote the efforts of schools and programs of public health to improve the health of every person through education, research, and policy. It serves as a weekly account of the excellence and relevance of CEPH-accredited member schools and programs of public health to the academic and practice community at large.